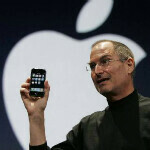 New numbers from a survey conducted for Morgan Stanley says that Apple could sell as many as 36 million iPhones in Q4 of 2011 and possibly as many as 190 million iPhones in 2012. The survey was conducted by AlphaWise on behalf of Morgan Stanley, and the numbers gathered in the survey came out to be quite a bit higher than most estimates. The survey from AlphaWise pegged Apple's 2012 iPhone sales at 190 million, which is 42% higher than Morgan Stanley's original estimates of 134 million iPhones, and almost 50% higher than the street estimate of 127 million (and, at the risk of having your brains explode with numbers, that would be a crazy 3.65 million iPhones sold per week in 2012.) Across the board the numbers from the new survey were much higher than original estimates. Morgan Stanley's chief Apple analyst, Katy Huberty, was even more surprised to find that the numbers suggest that iPhone sales will be even higher in Q1 of 2012, where the survey estimates sales could hit 41 million. Even more amazing given the widely repeated calls for the end of the tablet boom (or the iPad boom, depending on who you ask), AlphaWise found that 27% of respondents still plan to buy a tablet. The last bit of info is where it drops too far into the hypothetical world, though. Huberty estimates that Apple could boost iPad sales about 10 million units above Apple's manufacturing order if the entry-level iPad 2 were dropped to $399 and the original iPad were dropped to $99. This part is certainly possible, although a price drop from Apple usually only happens with the release of new hardware, like the iPad 3 or iPad 2+ or whatever it may be, and new hardware throws off the estimates, because then the entry-level device is no longer the 16 GB WiFi iPad 2. 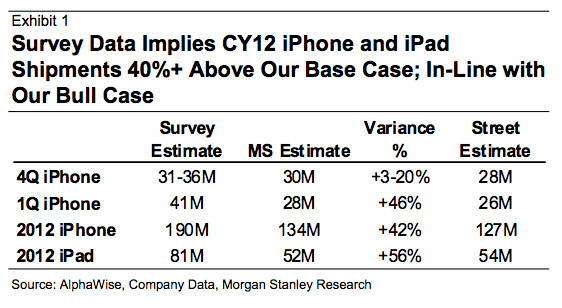 I would be 100% shocked if the iPhone sells more in Q1 than Q4. Projections are highly optimistic but I would guess not unreasonable depending on what they get out of the iPhone 5 and what markets they expand into. As well as what markets they get banned from if any. Hey! You're not allowed to make a reasonable post when you're posting under a profile intended to make fun of me! Really?? Is this you again taco, or do we have a new copycat idiot? seriously, get a life... and yes, im talking to the sniggly with the lower case "s". Hey, it has been really peaceful around here. Has Taco been banned again? Taco, has been banned for a while now. He created a few new accounts - which is also against the forum rules - so they all got banned. As his all recent posts have been trolling, we will give him some time before we allow him to post again. Did anyone ever check on the "Antifanboy" account. 95% chance of finding a taco there. I haven't noticed him in a couple days I think they banned him. Yes, if you try hard enough, you may eventually fool some people. I installed the doggy door for you. I'm going to call you Lucy. These numbers are as high as they go. Analyst predictions are a dime a million. Every day we hear this analyst says this and that and none of them agree. Will they have a good year? Yea, of course. Especially now that they have a new market in china. But they are priced so high for the average Chinese person, that its not going to be a huge increase in numbers. If you make 50 bux a month.. on the HIGH end of the scale (apple factory pay rates), then its going to take quite a long time to save up for an iphone. if moto or sammy wins any of their banning suites against apple, thats going to put a big dent in those sales predictions as well. Too many factors to say anything other than " its going to be another good year more than likely". But then again, Samsung is blowing their predictions out of the water too, so its still gonna be a tight race. Many Chinese people are still not in a necessarily advantageous economic position, Lucy. Remixfa was saying that working for an Apple manufacturing partner is high end income for an average Chinese Joe. original ipad for $99? Fat chance! $199 is the lowest I see that thing going, if its even still on shelves, solely to fend off the Kindle Fire, because most people wiuld rather have a 1st gen ipad than a Fire, I know I would even though it lacks a dual core processor and is an apple product, but unlike the fire its a GOOD product. lol, so much for analysts. well well well... those analyst know nothing.. my SpongBob crystal ball on the other hand doesnt lie.. and he stated. ( after 4 shakes)... that I needed to ask siri which I did.. and the iphone with its redesing this year.. blow out the 1 gen. quadcores phones.